Home Why KSC School’s Out Summer Camp? Why KSC School’s Out Summer Camp? There are many camps in Kentuckiana where you could send your child. 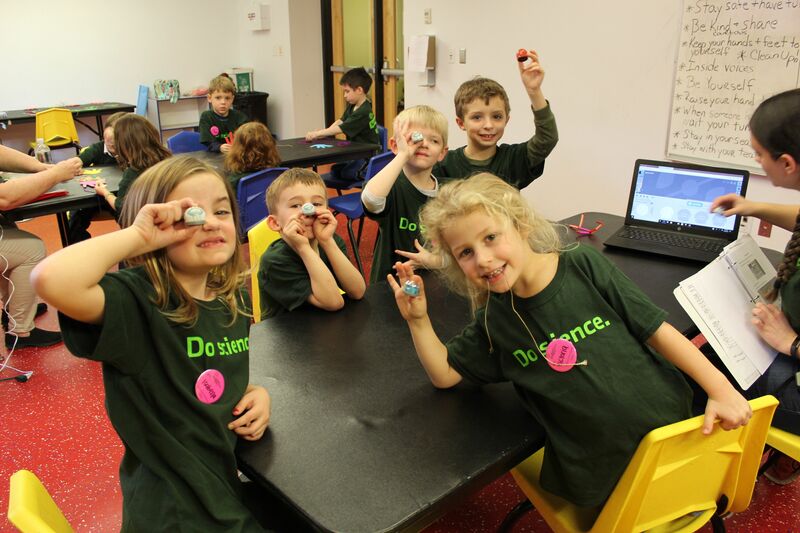 At Kentucky Science Center, camp is a unique experience. Hands on activities- Our camp curriculums are intentionally developed to empower campers to ask questions, play, tinker, explore, collaborate, test, experiment, goof up and to try again. Each camp experience is designed to have tangible connections to the Kentucky Academic Standards and is facilitated by our trained dynamic camp team of teachers, counselors and volunteers. Science Demonstration – During the week, campers will be able to experience science demonstrations facilitated by our education team. Theater experience- Once during the week, campers will be able to view a documentary movie in our 4-story digital theater. Science Center exhibits- Throughout the week, campers will get time to explore their favorite features of the Science Center such as the water table, Skyline, Gravitram, blue blocks, polar bears and more. Campers are scheduled to visit exhibits that are age-appropriate. For more information on our exhibits, please visit our Exhibits page. Committed Staff- Our Summer Camp team is devoted to ensuring your camper has the best experience. Our team is led by our Manager of Camp Experience, Michele Mazzei (michele.mazzei@louisvilleky.gov). Camp Teachers- are certified teachers from the local districts or currently finishing up a certified education program at a local university/college. Camp Counselors-are college students, who are interest in graduating with a degree in education or science with prior experience working with children. Their goal is to serve as an assistant to the Camp Teacher and help your campers have the great experience. Volunteens- are high school students looking to expand their future by helping in the classroom and exhibits. Support Team- Our camp support team include our camp leads, interns and supply specialists all who help oversee our daily camp operations.